The idea of ARS had been to showcase US talent but the first season was won by Italian Formula 3 driver Fabrizio Barbazza driving the Arciero Brothers entry. Kiwi Steve Millen won the opening round but the TrueSports ARS team was shelved after Jim Trueman's death. 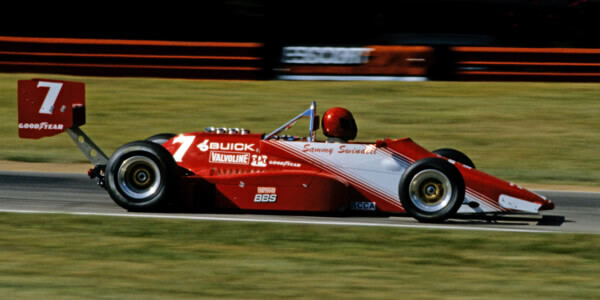 Millen was forced to drive one of the unloved ARS "house cars" but scored a remarkable win in this car at Mid-Ohio before getting a permanent seat again in the Hemelgarn team. Californian Mike Groff was the quickest of the Yanks: he won two and twice retired from the lead but his decision to prioritise the FSV title - which he lost narrowly to Didier Theys - kept him out of contention for the ARS title. The fourth race winner was Jeff Andretti who had been very quick in FSV in 1985 but disappointed in ARS. Being an all-new category, ARS had no established teams to draw on and several of the teams that were put together failed to complete the season. Truesports' team was disbanded after Jim Trueman's death but also the teams of Jerrill Rice and Kim Campbell closed for financial reasons. The SCCA's ability to run the series was brought into question when the race at Miami wasn't timed. As some teams had been given time penalties for using too many crew members at pit stops, this meant full results couldn't be issued until a month later. The points system used was novel: the SCCA's preferred 20-16-14-12-10-8-6-5-4-3-2-1 system for the top-12 places, but with an extra point for pole position and another for the driver leading the most laps. The table shown here is from On Track 22 Dec 1986 p62. See also Gordon Kirby's review of the season in Autosport 1 January 1987 pp30-31. Both ARS and IndyLights were researched by Phil Harms before his death and the collated results published on motorsport.com. The results here are based on his work. Chassis identities have not been possible to determine yet but we remain hopeful that records exist somewhere.